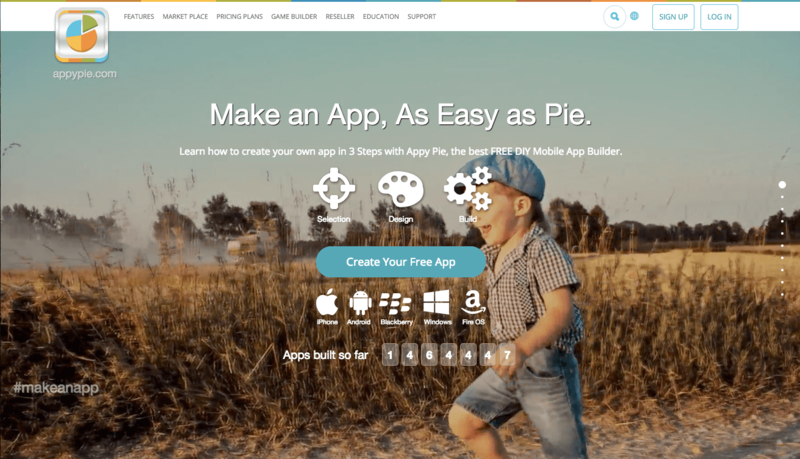 AppyPie Review - Half-baked or good enough? 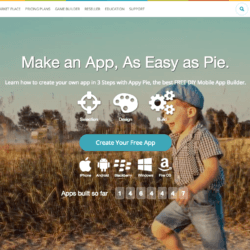 AppyPie users have built nearly 1,5M apps since the company’s launch in 2014. Combine this with the fact that AppyPie call themselves “the fastest growing cloud-based Mobile Apps Builder Software” and you’ve got to wonder: how did they manage to take such a big slice of the app maker market? At a quick glance, there could be two reasons for their success. First, they have a free version (with ads). They also say you can implement impressive services such as Uber and Tinder clones, and seem to support a ton of unique features like CRM and Augmented Reality. But speaking of reality, we’ll see that unfortunately these claims are slightly misleading. 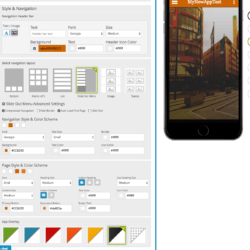 While the editor is decent enough for a very basic app, more advanced features always rely on 3rd party solutions and pre-made templates that are far from impressive. So is it still worth creating your app with them? Let’s break it down below. Android only. 5000 push notifications, 200MB disk space and 4GB monthly bandwidth. Still shows AppyPie branding. 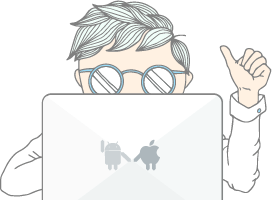 Android and PWA. 10000 push notifications, 400MB disk space and 8GB monthly bandwidth. 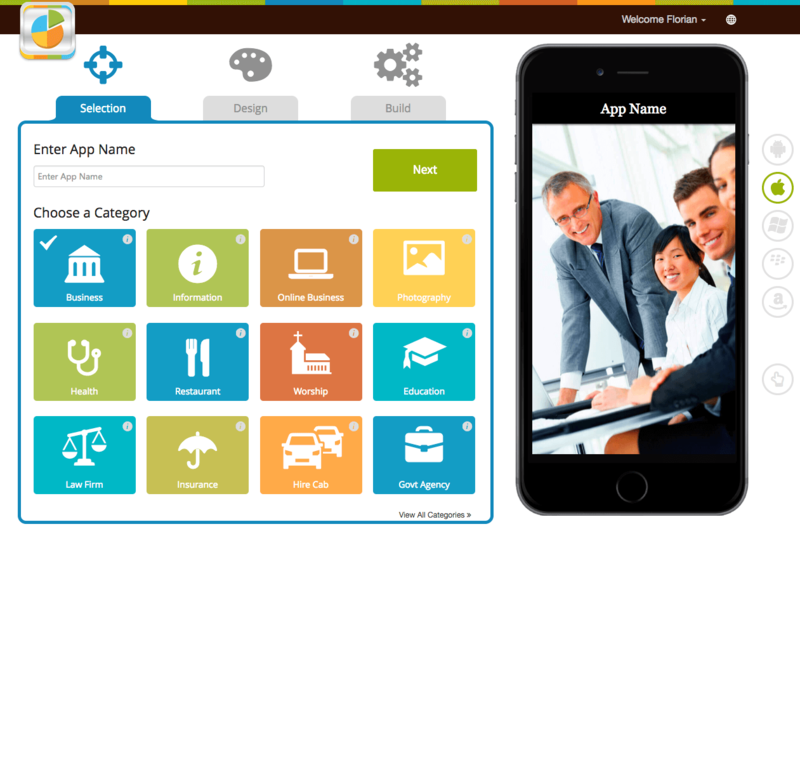 iOS, Android, Windows, Blackberry, Fire OS and HTML5 support. 25000 push notifications, 600MB disk space and 12GB monthly bandwidth. Note: prices are for yearly subscriptions. There is a free plan that shows ads from the AppyPie network. The live editor is user-friendly and easy enough to use. You can just click on “Pages” to enable certain functions. If you want a very basic app, you can make it in minutes. 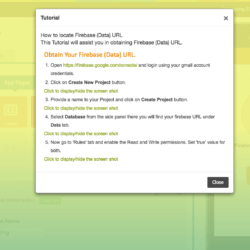 In fact, you can even build and preview a basic version of your app from their web page without signing in. 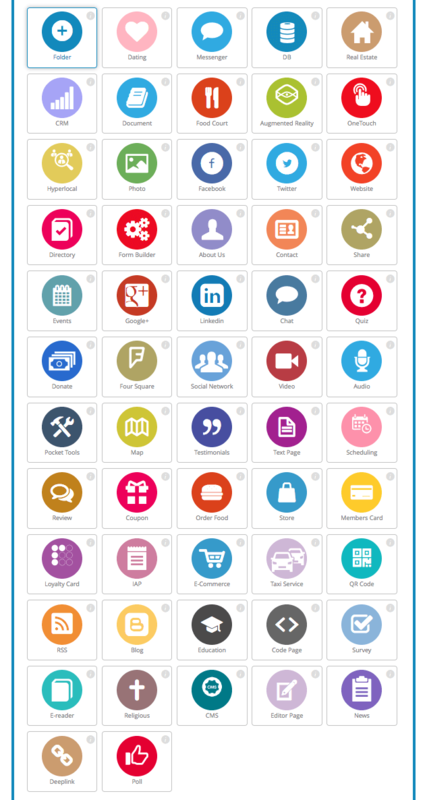 AppyPie gives you the option to add 56 types of features, or Pages, for your app. These are listed in categories such as Social, Commerce, Contact and Information. Most of them are very straightforward, for instance, adding a Quiz or a About Us page. However, the most impressive features don’t feel very accomplished (see cons). You can easily create an in-app store or link to an existing one with more than 10 platforms (Shopify, Etsy, Amazon, etc…). The support for members’ cards and loyalty programs is good. AppyPie also gives you de facto Mailchimp integration and Analytics along with some basic marketing tools (100 free promotional emails). AppyPie claims you can easily build an Uber or Tinder clone. This may be true in theory, but you will need to integrate your app with external 3rd party developers. 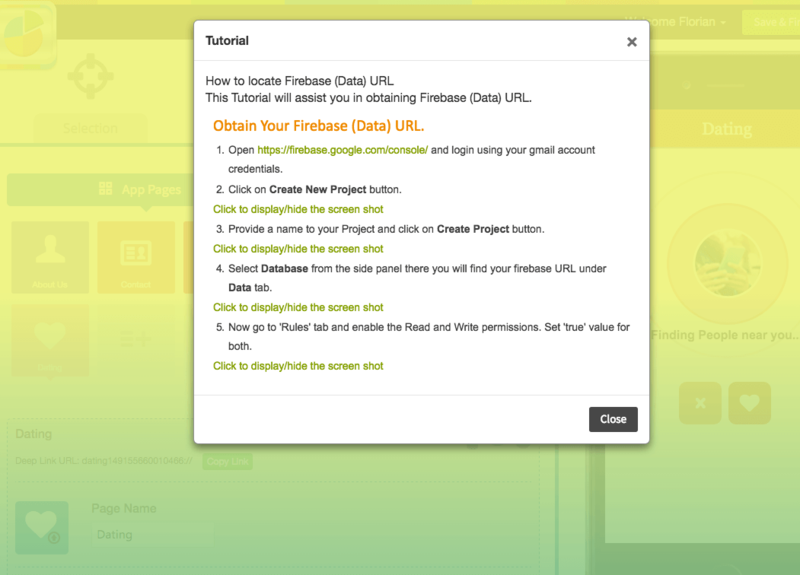 If you’ve never heard of Google Firebase, PubNub, GrabHub or Vuforia, this might come as a surprise. Moreover, some of these external services are expensive, so this feels like a real cop-out from AppyPie. The templates look a bit dated. 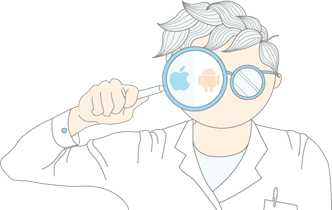 All the published AppyPie apps we’ve checked tend to look the same. 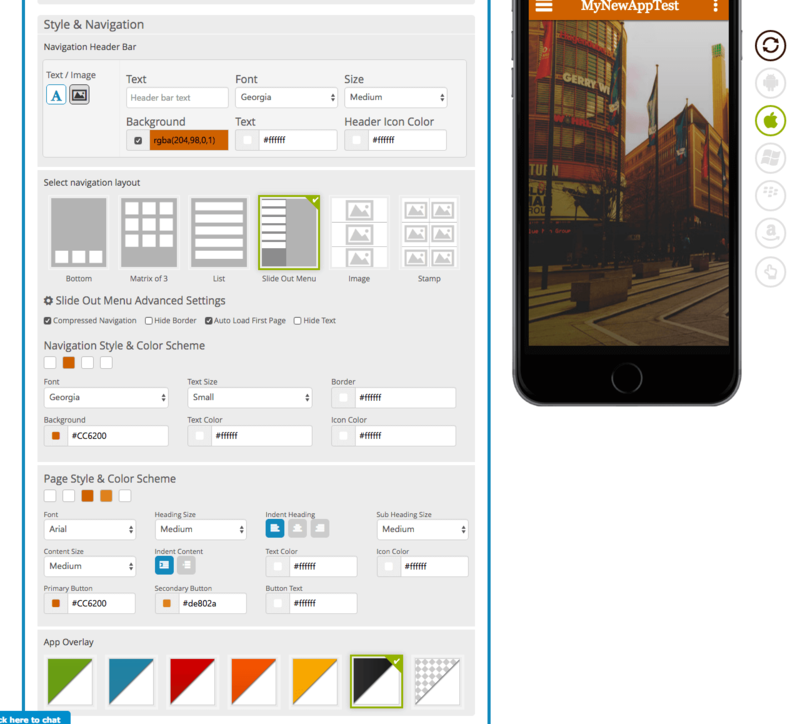 You can tweak a few things like the background images and layout options, but not much more. Even if you sign up with 3rd party developer options to create, say, your Tinder clone, the AppyPie documentation leaves a lot to be desired. The online videos just tell you to fill certain fields without explaining what they do. The support pages aren’t much help either. AppyPie is, for the most part, user-friendly. It’s very easy to create a basic app in minutes, and we like that you can do it before you even sign up to their service. However, they do make it look like the beta features are just as easy to use – they’re not. You will need time to understand how to integrate external services if you want to create a dating app, a taxi app or – good luck with that – an Augmented Reality app. Not the most exciting templates on offer. You can choose from 15 layouts, and they look decent enough. Background pictures and text are very easy to edit. 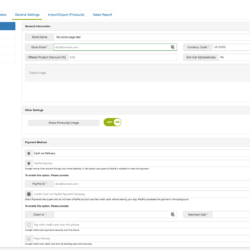 The builder and support are available in 10 languages. However, some of them clearly show Google-Translate-type grammar and spelling mistakes. You can build a multilingual app (kinda). The workaround is to add multiple folders and recreate your app in various languages in each of them. Like many other app makers, AppyPie increased their price for iOS following Apple’s new guidelines. You’ll need a developer account ($99 per year). They now also offer Progressive Web Apps. You can run your own adverts with AdMob and Air Push for all the paying plans. Limited to 5000, 10000 and 25000 with the Basic, Gold and Platinum plans respectively. AppyPie supports geofencing and local push notifications with all its paying plans. You can create your basic store directly within the app and accept payments via PayPal, credit card (via Paypal gateway) or cash on delivery. 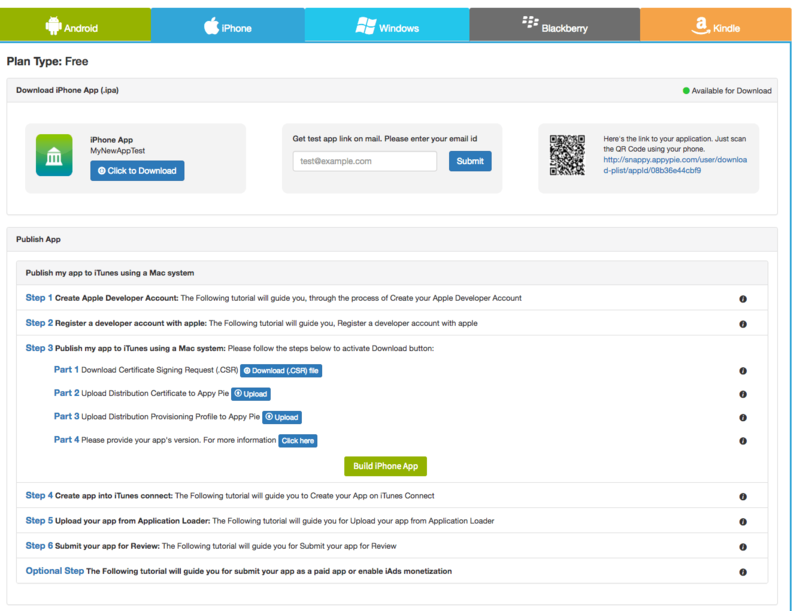 You can add a “Custom Code” page and define what’s on it yourself. 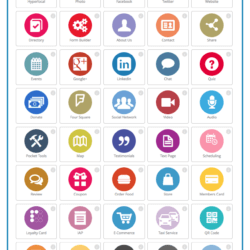 Good – you can integrate pretty much any social media account including the usual Facebook and Twitter, but also LinkedIn, FourSquare, Instagram and Pinterest (in the Photos section). Offers pre-made Coupon and Members Card pages. These are easy to set up and let you generate your own barcodes and QR codes with validity dates. You can also create a Loyalty card with a pre-made template to offer a free item after x number of purchases. Standard Mailchimp integration. They also have an email marketing feature, but it’s not very advanced. The first 100 emails are free and you need to purchase the next batches at roughly $5 / 1000 emails. You can add up to 5 moderators per app. Available, even with the free plan. 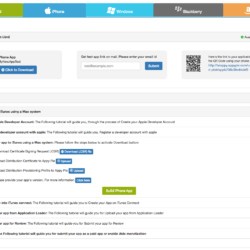 You can get an API for certain features, such as your user lists. AppyPie lets you try your app in your browser. You can also download it by clicking a link directly from your smartphone or scanning a QR code. Note that you cannot edit apps after 24 hours if you’re using the free plan. You can integrate Google Analytics – they also offer basic analytics info. 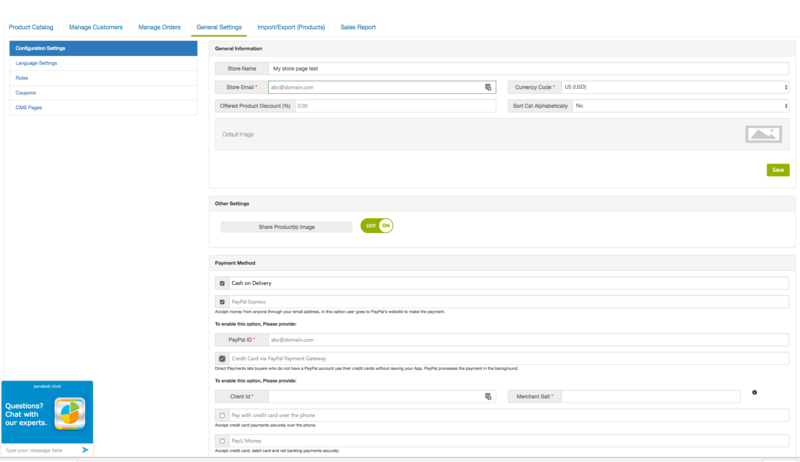 AppyPie offers a 4-tier reseller program. We used the live chat and the answers were good and quick. A question sent via email was replied to within 24 hours, but wasn’t very clear. Unfortunately, we’ll have to take some points away because the FAQ and tutorials left us with more questions than answers. AppyPie have made good efforts in improving their usability over the years, but it’s still not the most fun editor in the world. AppyPie promises a lot of things, but does not always deliver on them. They seem to add a lot of feature just to grab new users, but you probably won’t need 90% of them. However, AppyPie is not a bad choice for a basic information app or a simple store. We can see why people would choose AppyPie. 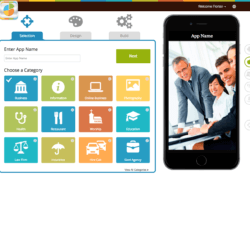 It is easy enough to create a simple app in minutes, and the basic features are decent. This is particularly true if you want to create an unsophisticated in-app store, which makes it a good choice for small businesses. The editor, meanwhile, does its job, if you are happy with slightly dated designs. For the best looking app out there, AppyPie probably isn’t for you. Similarly, some design choices do not make sense: for example, you have to tweak certain settings from the editor and others from the dashboard. Our main criticism, however, is that we feel cheated by AppyPie because they promise you can do a lot with your app. The truth is that adding advanced features is technically advanced, sometimes costly, but worst of all, very confusing due to their poor tutorials. And the proof, as they say, is in the eating of the pudding. They used to showcase user-made apps in a gallery: nobody has created the next Uber or Tinder with AppyPie yet. Yes, you can see how to do it here. Yes, here’s how to do it.